So here it is, the last Loud and Proud of 2014. 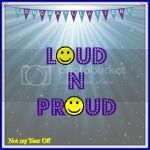 The Loud and Proud team will be taking a well deserved break over the Christmas and New Year period and coming back on the 8th January 2014 so this is your last chance this year to join in the linky. This week has been a bit mad in our house as work goes mental and the world tries to crowbar everything into the last week before Christmas. Suffice to say I cannot wait for a good wind down over the the next two weeks. My proud moment this week has to be Little Z turning the grand old age of FOUR and I have the spent the week wondering how my little boy is grown up and how time has flown by so very very quickly. My greys tell me its probably about the right kind of aging that’s occurred but it does feel like its gone by in a blur. My other little proud moment is seeing Little Z in his very strange sounding “End of year” play. I actually have no idea what its about at all other than it sounds very much like some kind of politically correct but completely changed Christmas play. He is going to be one of the 3 little bears. I’m pretty sure it also has Mary and Joseph in it, baby Jesus and ….I THINK….Little Red Riding hood. I’m really confused but I am SO excited to see him in VERY FIRST PLAY! He even has a line about bringing porridge and I am hedging bets on whether he will actually say it or prefer to leg it straight off the stage. I think I will just happily bawl my way through the entire thing and then buy the DVD, photos, mugs and other highly priced items. Lovely! Then hopefully we are going to enjoy a couple of quiet weeks as a family. Well….quiet ish. So come link up all your lovely loud and proud moments whether they be big or small, old, new or simply a bawling opportunity as you gaze on your off spring fluffing their lines in their very first play. Hope everyone has a very restful break over the next few weeks. See you in the New year when Suzanne from 3 Children and It will be hosting. How lovely! Good look to Z for the ‘end of year play’! Happy Birthday Little Z! 🙂 Enjoy being four #loudnproud.